Everybody has restaurants that have special meaning for them. 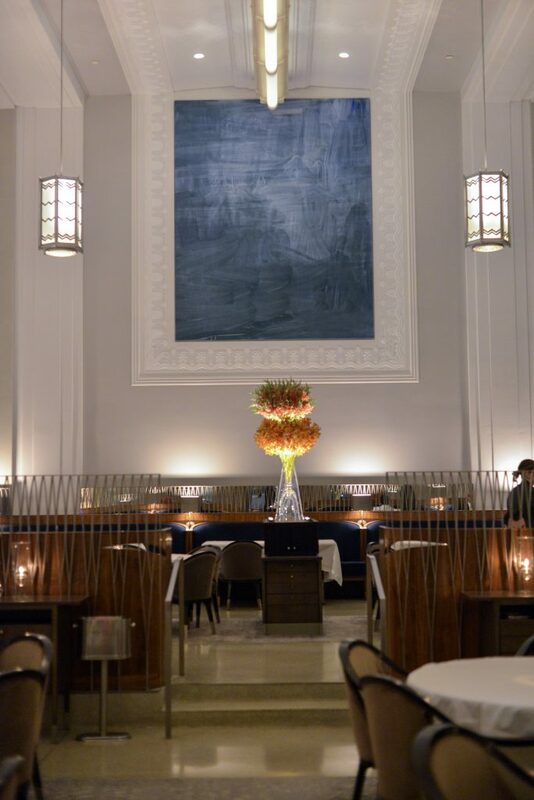 For me Eleven Madison Park is one of them even though I had previously only visited it once. So when I was going a week to New York with my wife and I had just gotten a new job celebrating it at EMP was obvious. Walking in the revolving doors you are impressed by the grand dining room immediately. With about 20m to the ceiling, a massive piece of art at the end and a dining room that fits about 70 people plus the bar grand is an appropriate word to describe the experience. To enhance the experience you are greeted by a waiter wearing what I can only imagine is a high end custom made suit and takes you to your table. Of course the waiter moves the table ever so slightly to make it easier for you to get in. Of course without the table making noise. A nice touch that early on shows that they think of everything. The first snack of the menu was already on the table when we got to the table. 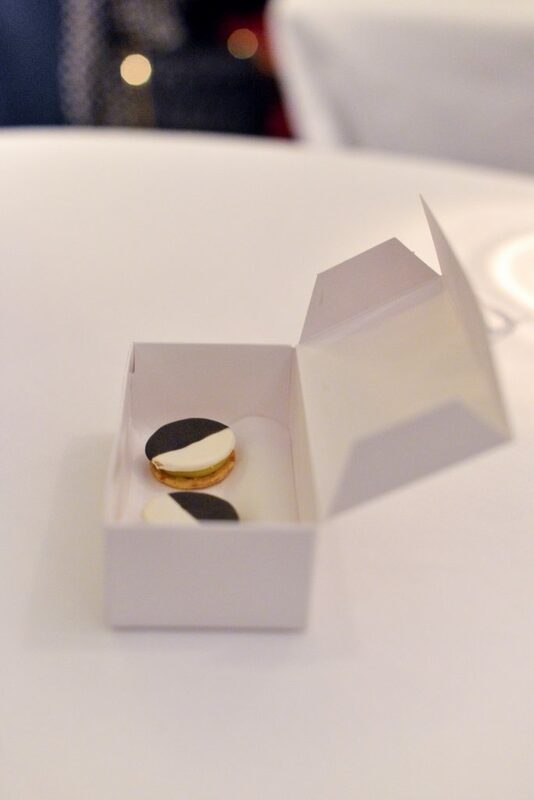 In a small present were two cookies of goat cheese and apple. It was a very elegant way to start the evening. 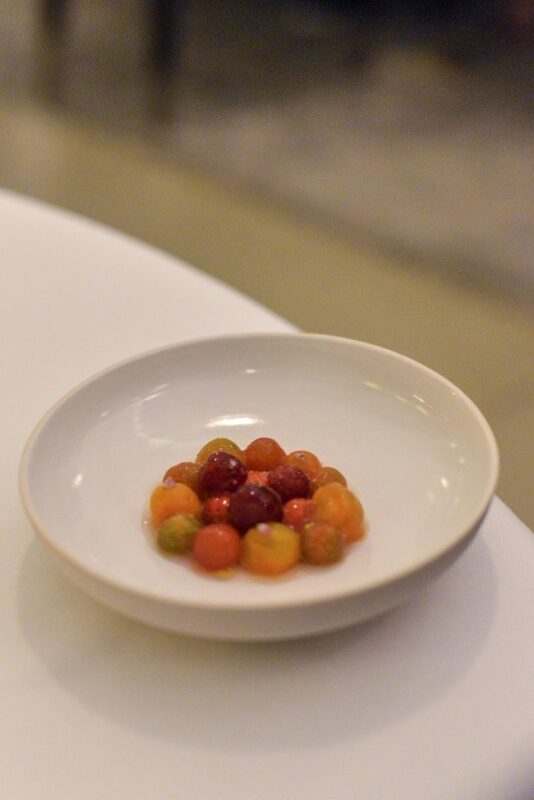 As it was late summer the tomatoes are in season and amazing and therefore playing a big part of the next two dishes. First with tomato filled dosa with a refreshing tomato relish and goat cheese. The best part however was the tomato tea that was served with it. It was just a very intense tomato flavor in a way pure and delicate way. To follow this was tomatoes and berries. A very simple dish that I couldn’t quite get my head around. It was neither sweet nor acidic, but somewhere in between. Caviar and cornbread was to follow. A dish that I thought was quite symbolic for the evening. To start with a big cart with beautifull silverware was was pushed in. From here our waiter would also prepare our dish. 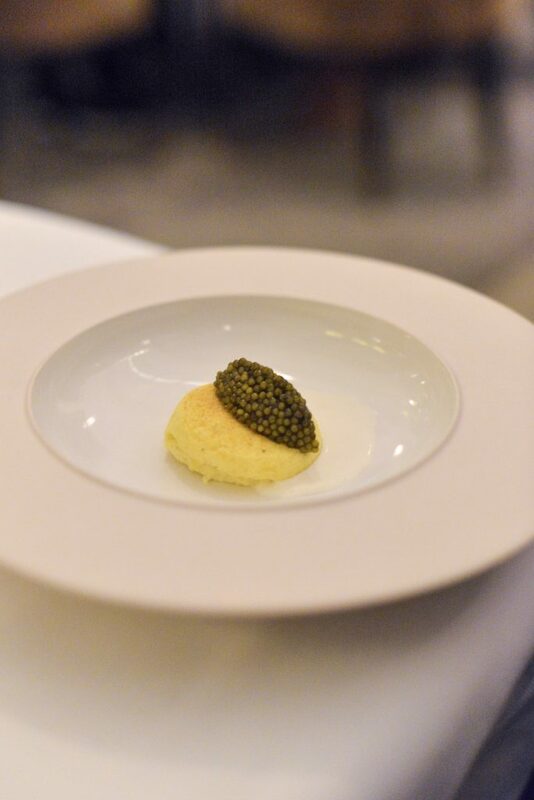 The top part of a soufflé was served with a generous amount of sturgeon caviar. Maybe the best caviar dish I have ever had. The soufflé was extremely light and fluffy and an amazing match to the salty caviar. A caviar that had a stronger taste of fish than I am use to which gave it more debt than usual. 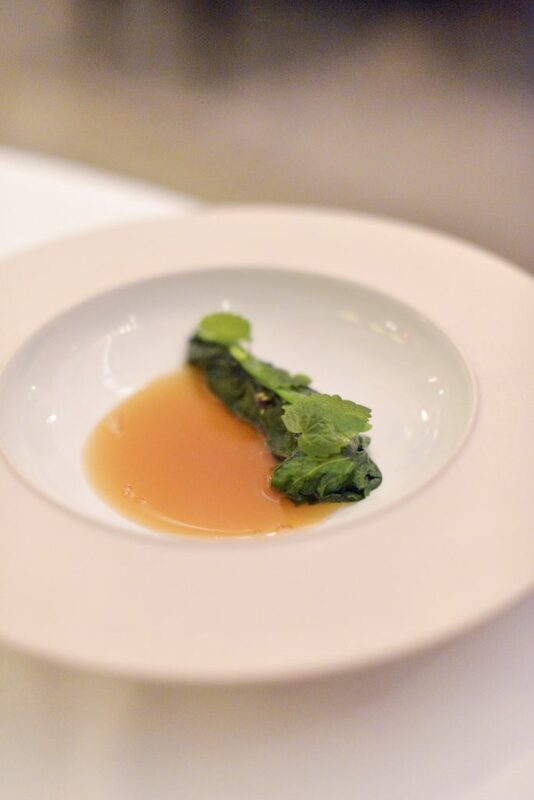 A dish that was just silky smooth, luxuries and of course also one where the waiters played a part in the preparation. Another amazing dish was to follow. 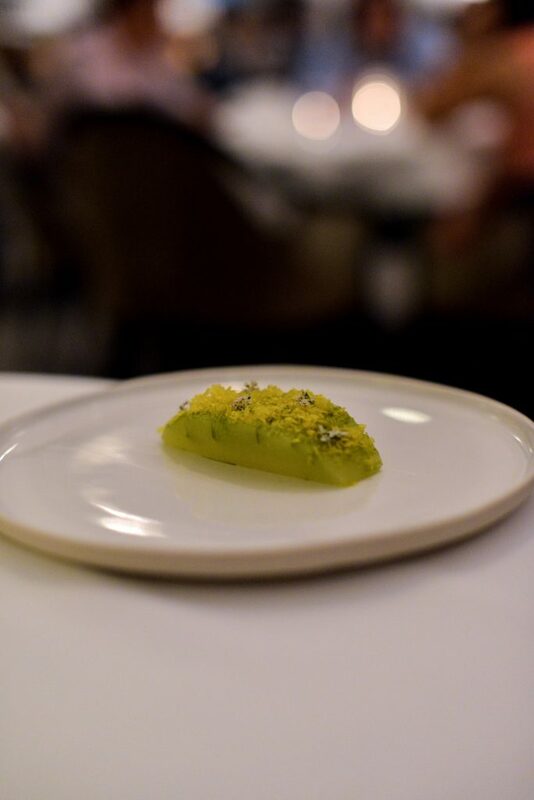 Melon that had been compressed with coriander and pressed yogurt, filled with a bit of whey, olive and shaved smoked egg yoke. It was fresh, it was simple and it was delicious. Of course it had been cut half way through making it easy to eat. Yes they do what they can to make it relaxing to be a guest. Butter poached lobster wrapped in bean ecrass with a lobster sauce. Simple and delicious, but it was jus not amazing. On a practical matter I would have preferred a “steak knife” or similar as I felt a shame almost desecrating the dish cutting it out with my spoon. 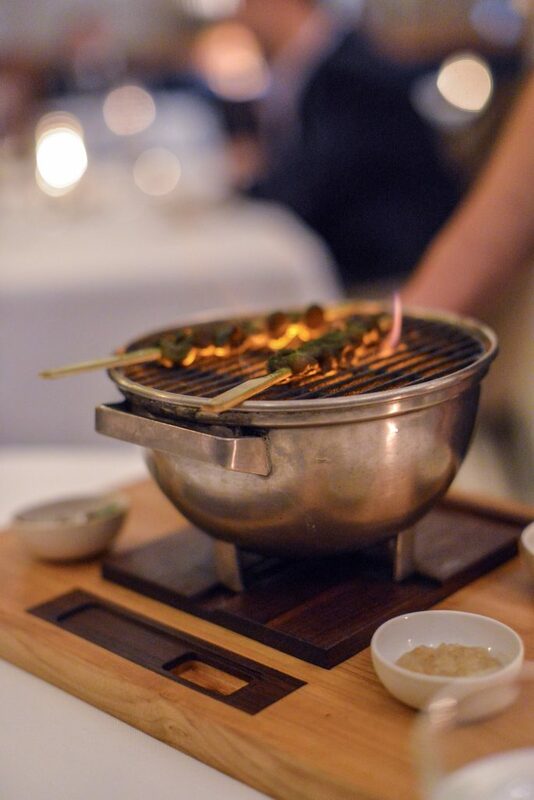 Back at amazing with table grilled snails with condiments and served on a crispy leaf. The snails had been fed on mint for the last 3-month and hereby giving a nice minty flavor to the dish. France meets The Middle East with great spicy condiments. We finished the savory section with classic American flavors. 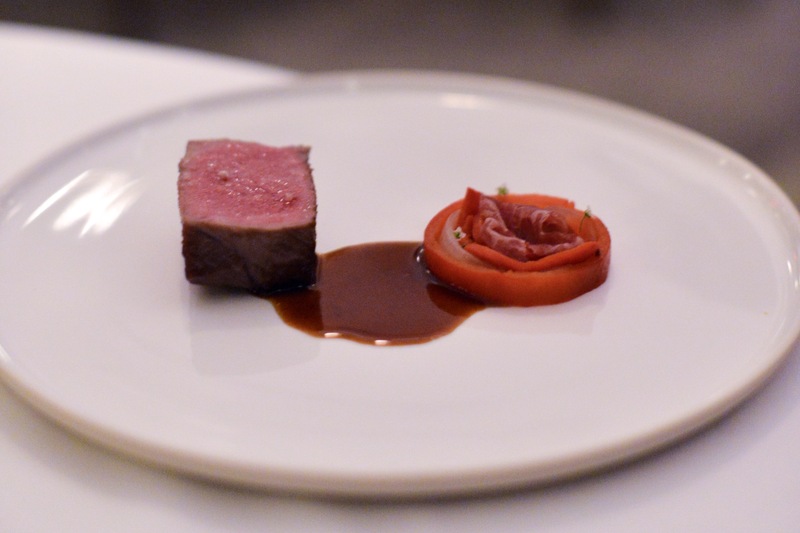 140 days dry aged meat served with onions and sweet red pepper. Classic and delicious, but nothing new to the dish. To start the desserts my wife had a very simple and delicious dessert. Blackberry with caramelized milk ice cream and a lemon sauce. 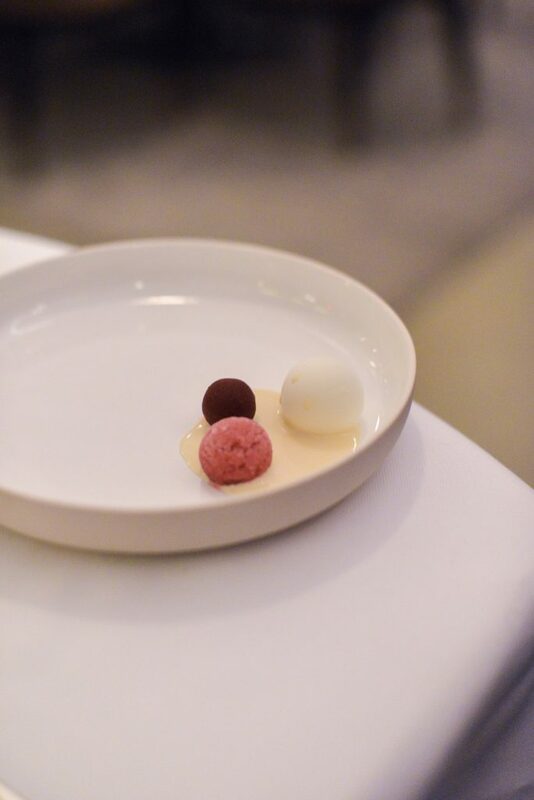 A refreshing dessert to finish the meal inspired by a trip Daniel Humm made to India. I had a classic chocolate cake with sorbet with shortbread and coffee meringue. A nice dessert and coffee and chocolate is a classic combination but I just didn’t love it. 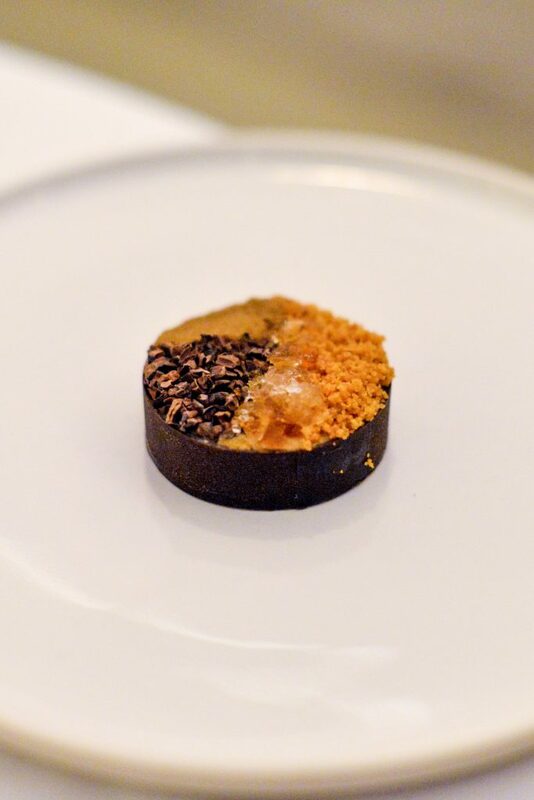 Eleven Madison Park is famous for the balance between front house and the kitchen and this night I really felt that EMP is about the whole experience and that experience already starts walking in the door. 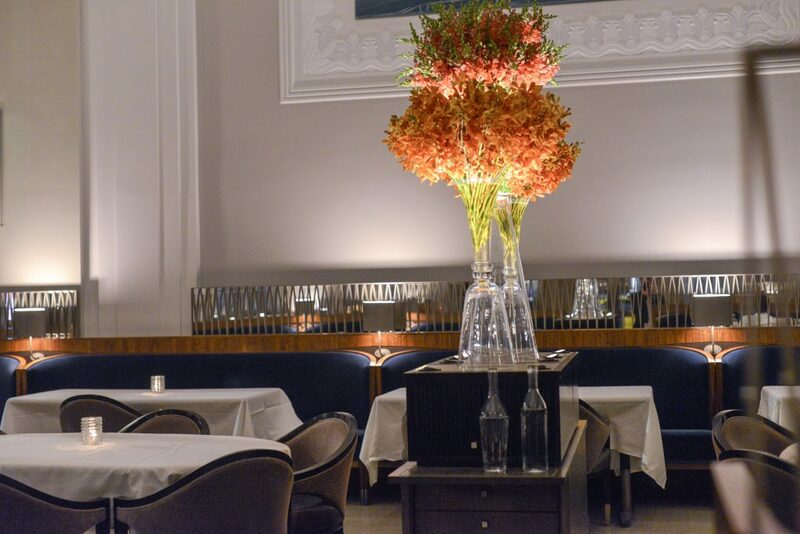 With the remodeling of the restaurant the sensation of the place feels even more luxurious and well quite frankly open and welcoming and quite frankly takes your breath away. The small help of moving the table to make it easier to sit down are just some of the small touches that emphazises this. Waiters arrives quickly followed by a nice glass of champagne. The first snack arrives a little later than I am use to and to begin with I thought it was weird as you are usually bombarded with snacks. The extra time just meant that you had time to relax and enjoy the champagne, the space and the company of course. In the same spirit the menu is only 8-10 dishes, which provides for a very relaxing experience where the focus draws from the food to the whole experience where several of the dishes were finished tableside. I visited EMP 2 years ago where we just had the bar menu. This time for the full experience and the change made a huge difference. The menu was smooth and delicious in a great mix between classic French and modern American but without at any point being heavy. But EMP is not just about the food it truly is a complete experience and maybe the most complete experience I have ever had. 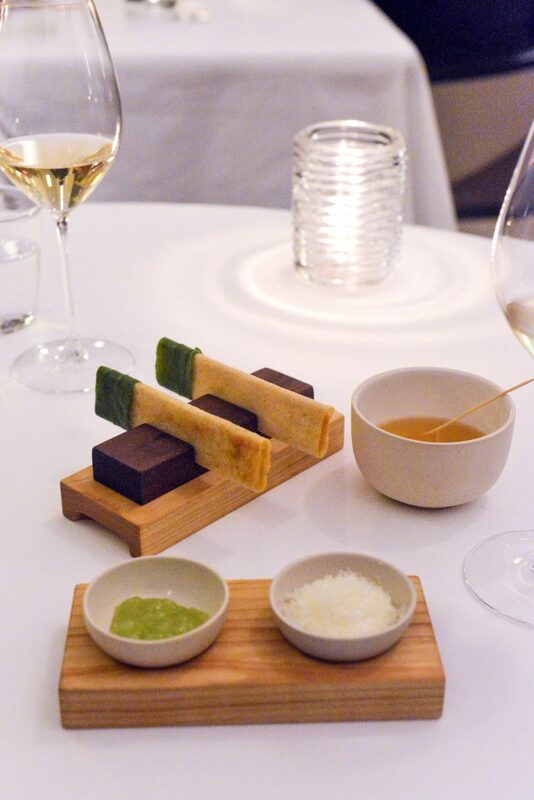 I have had more creative and delicious food in other restaurants, but I have never had an experience that felt so smooth, luxurious and complete. A visit to EMP is like watching a mechanical clock with thousands of pieces that all work together to achieve true precision and the luxurious, personal and relaxing experience that EMP is.